The garage door at my house has barely worked since The Departure. It was not long after that event that one of the springs snapped, sending the door crashing to the floor with such a thud that the whole house shook. It took two handymen to liberate my car, which then had to be parked in the driveway until I could get door repaired – many months later, around the time the divorce was being finalized. Within a few months, though, the garage remote stopped working, resulting in, once again, my garage being unusable for its intended function. I was pretty sure it was just a dead battery, but I couldn’t seem to find the right size battery to replace it. Somewhere in the midst of this, my dishwasher started giving me trouble – lots of it. This was a more pressing matter than the garage door, given how much I like to cook, and how many pans I seem to use when I do – as well as how many plates The Child seems to use for, well, everything. The dishwasher isn’t that old, and it was fairly high-end when it was bought, yet within a couple of years had stopped working. A repairman was called and replaced the control panel. They go bad on this model, he said. Earlier this year, the dishwasher stopped filling with water, but everything else seemed to work – meaning that the cycles still ran and the heating element still heated up as though there was water, baking the food bits solidly to the dishes. Indeed, it seemed to do a better job with heating and baking than my oven. Maybe it was hoping I’d retire the oven, and wanted to apply for the job. I called the repairman back and he couldn’t find anything wrong with the dishwasher, but when he opened the intake valve, there was a buildup of crud from the pipes that was blocking the water. We turned the dishwasher on and no problem. The dishwasher worked fine for several weeks – right until the warranty on the repair expired, in fact. I called a different repairman, because I thought the problem might be a blockage, rather than the dishwasher. This repairman checked and completely the water heater and the pipes, and pronounced each “The cleanest I’ve ever seen.” His assistant, meanwhile, checked on the dishwasher, the valves, the filters – everything he could think of. Neither of them could find a problem. Of course, when they turned on the dishwasher, it filled up nicely, just like it was supposed to – and not like I’d been filling it for the previous few days, with a bucket of water. It proceeded to work fine for another two weeks, until Mother’s Day. That day, The Child cleaned the kitchen before bringing me a cup of coffee in bed. We headed out to have brunch together, and the dishwasher was running when we left – and also when we came back. What time did you turn this on? I asked her. It was now noon. After six hours in my dishwasher, everything was baked on the dishes about as well as any kiln could have done. I shut off the dishwasher and grumbled and decided that on Memorial Day, I would go out and patriotically replace my dishwasher – which I did. In the meantime, I resorted to running the old machine as a manually operated dishwasher, by filling it with a bucket of water. I think you need to re-sync it, said my father. I think it does not like me, I replied. The following day, I had several people coming to my house in the evening, so before they got there, I rushed about tidying up. I cleared the counter of dirty dishes, loading them into the dishwasher, and – since I was in a hurry – simply turning it on. Fifteen minutes later, it dawned on me that I had not filled it with a bucket of water, so I went back to fill it, and discovered it was already full. As though it was working normally and not in need of replacement. Just to spite me, I told my father. I think we’ve moved beyond theoretical, I said. One of the ladies who came over that night knew I like rhubarb, and brought me several large stalks from her garden. It’s funny how a small, well-timed gift can completely change my outlook: I went from being convinced the inanimate objects in my home were rising up against me, to being touched and thrilled at the generosity and thoughtfulness of someone I barely know, who remembered this little thing about me. So a few days later, I woke up early, and made muffins. I don’t remember where I originally got the recipe for these, though I sure wish I did. The muffins and light and moist, with just the right amount of cinnamon accenting the tart rhubarb. I know a lot of people love strawberries with rhubarb, and it is good – but I like my rhubarb to be the star of the show, as it is here. I’ve been reading various baking tips and tricks recently, and found a couple of them really improved the end result when making these muffins. First, sifting flour a couple of times before measuring it will result in a very light muffin. Second, and just as important, remove muffins from the pan immediately when they come out of the oven, and cool them on racks. If muffins cool in the pan, the steam cannot escape, and it it causes the muffin to become more dense and hard. Cooling them on racks prevents this. It made a huge difference – it’s totally worth the burned fingertips. You probably knew all that, but I didn’t, so I thought I’d tell you – just in case. Heat the oven to 400°F. Line a 12-cup muffin tin with baking cups. Bake the muffins until they’re golden brown, spring back most of the way when gently pressed, and a pick inserted in the center comes out clean, 18 to 22 minutes. I seem to have the same affliction with my car. Nothing is ever wrong with it when I take it to the shop – until I’m half-way home… then it stops… cold … in the rain. It’s now parked at the vacation rental where I throw rocks at it daily, just for good measure. The muffins look lovely. But they’re rhubarb. I grow it because it’s pretty, but Rhubarb is just one of those head snap, knee-jerk, abrasively tart things my system cannot tolerate. But I do love a good sour cream muffin, I think I’ll hang onto this as a muffin base. Thankies! I’m lucky to have rhubarb in the garden, but I guess I have used it all up for this year. Now the plant needs some rest and keep its remaining stalks. 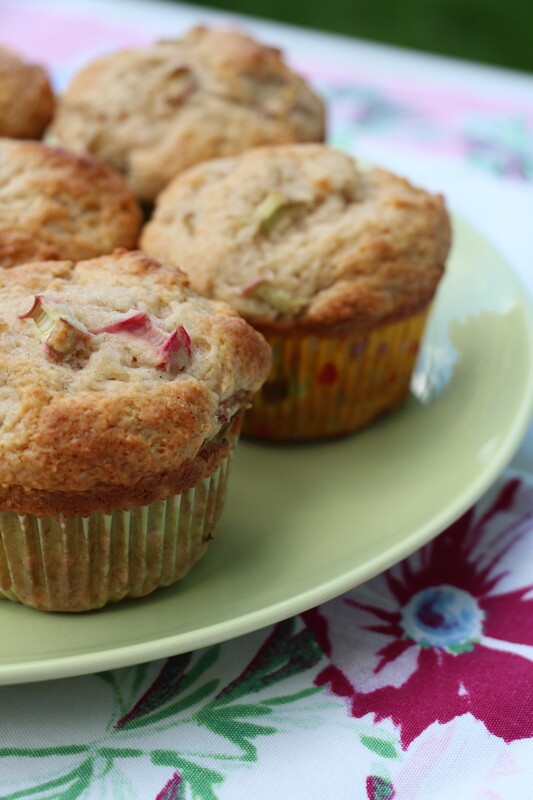 The rhubarb muffins sound great. The troubles you were going through with your inanimate objects sound horrible to me. I couldn’t stand it. Happily, so far, everything is working … right … apart fromk the car, but there I know, it only happens when it’s wet. The dishwasher continues to torment me. I won’t mind saying goodbye to it. I’ve sort of given up on the garage altogether. I hope to have rhubarb in my garden next year – it’s so lovely and versatile!